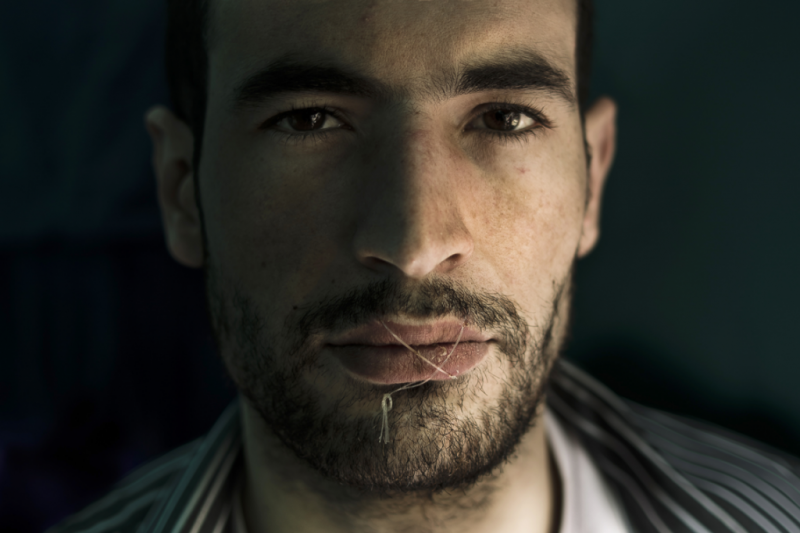 Lips sewn together, Kiarash Bahari, 27, shivers in a tent with five other hunger strikers for only one reason: “It’s better to starve to death in London than die on a torturer’s table in Tehran.” His hands are shaking. His last remaining pleasure (a rolled-up cigarette) has to be made for him. It’s his 16th day without food and the day I take his portrait. Sometimes photography can be a calm eye in a chaotic storm: a temporal fragment that catches a fleeting emotion or one looking to be suppressed. That’s what I see when I look into Kiarash’s face—conflict and contradiction. Calm eyes floating above a barbaric schism of fish wire. I’m fascinated how such contradictions can coexist in an image. It’s similar to when I see my own work in print form: hidden depths bubbling up that were only hinted at in the viewfinder.